This week, observers in the Southern Hemisphere looking west just after sunset will have a fine view of the planet Mercury. This will be the view from Melbourne half an hour after sunset. Even though Mercury is one of the brightest objects in the sky, very few observers have ever seen the planet in the night sky. That's because it never strays very far from the sun, and is usually lost in its glare. This week is one of the rare exceptions to see Mercury, but only if you live south of the equator. The planet will be at its greatest elongation from the sun on Sunday (Sept. 21). Because of the tilt of the Earth's axis, this will place it high above the horizon in the Southern Hemisphere, but too low to be observed in the Northern Hemisphere. Earlier that day, Mercury will also pass about half a degree south of the bright star Spica in the constellation Virgo. (Your closed fist held out at arm's length covers 10 degrees of the night sky). Mercury is slightly brighter than Spica. Further up in the sky, the planet Saturn will be intermediate in brightness between the two. I find the best time to spot Mercury is about half an hour after local sunset. Even then, binoculars are helpful to spot Mercury. Once spotted in binoculars, it’s usually easy to see with the naked eye. Also this coming week, on Tuesday, Sept. 23, the sun will reach its equinox, crossing the celestial equator moving southward. This marks the first day of autumn in the Northern Hemisphere, and the first day of spring in the southern. 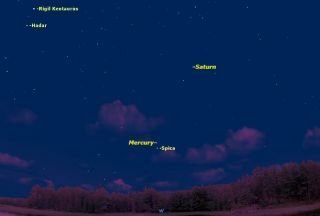 Editor's note: If you live in the Southern Hemisphere and capture a great photo of Mercury and Spica, or any other night sky view, we'd love to see it. You can send in photos and comments to: spacephotos@space.com. This article was provided to Space.com.com by Simulation Curriculum, the leader in space science curriculum solutions and the makers of Starry Night and SkySafari. Follow Starry Night on Twitter @StarryNightEdu. Follow us @Spacedotcom, Facebook and Google+. Original article on Space.com.